Creative minds thinks alike. :) One of the projects that I was working on before the power outage was hand made napkin rings. (to be posted soon) They are totally different than these pretty floral rings by Crystal of Make It Easy Crafts.. 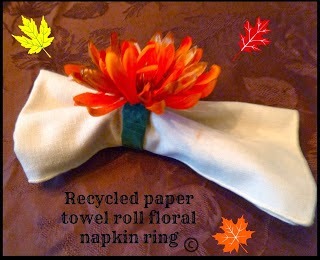 I love how easy Crystal's napkin rings are to make, and that you can easily customize then depending on the holiday or event. If you would like to try and make some of your own, be sure to check out how on Make It Easy Crafts here. Thanks so much for linking up to Dare to Share Crystal! WOW! so nice and wonderful.Thanks for share.